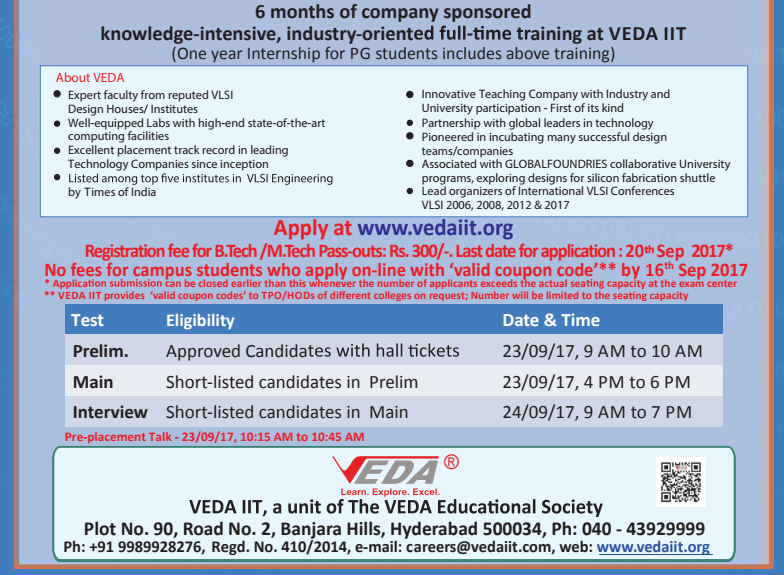 Campus Recruitment Test of VEDA IIT on 28th October 2017 for B.Tech & M.Tech 2018 Passouts. VEDA IIT provides valid coupon codes to TPO/HODs of different colleges on request. However the number of coupons will be limited based on the seating capacity available at exam center. Application submission can be closed earlier than 18th Oct, 2017, i.e., whenever the number of applicants reach the actual seating capacity at the exam center. Application submission can be closed earlier than 24th Oct, 2017, i.e. whenever the number of applicants reach the actual seating capacity at the exam center. 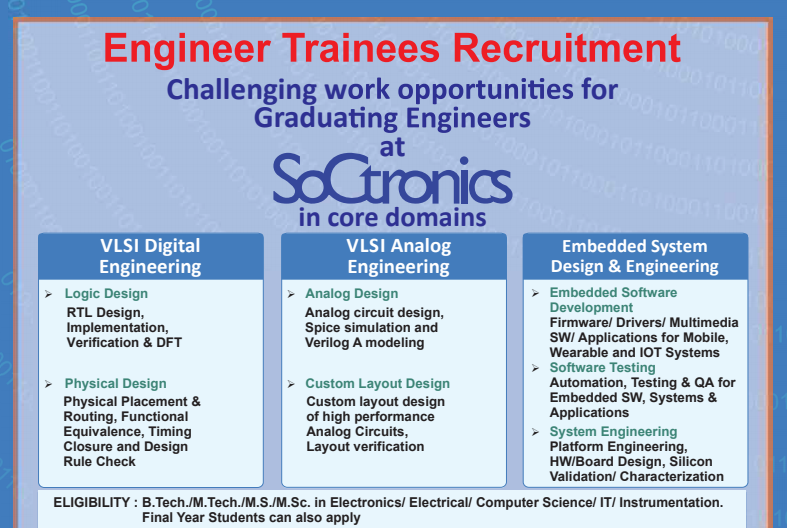 The current recruitment drive will be very useful for all Electronics specialization students who are in the Final year B.E/B.Tech with 70% (equivalent CGPA as per approved conversion factor) as they can simultaneously complete both 6 months company sponsored full-time training program and their project. It will also be useful for the second year of ME/M.Tech/MS with 70% (equivalent CGPA as per approved conversion factor) as successful candidates can avail company sponsored one-year full time Internship. Selected meritorious students will get an opportunity to undergo Company sponsored training in one of the core domains: VLSI Analog Design/VLSI Custom Layout Design/VLSI Logic Design/ VLSI Physical Design/ VLSI Standard Cell Design /Embedded System Design/ SW Testing/ System Engineering and get into employment in our consortium companies subject to successful completion of their sponsored training at VEDA IIT and completion of their degree in the respective University. For further information, visit: www.vedaiit.org and Contact at 040-43929999 or 9989928276; hr@vedaiit.com.